ON THIS DAY IN 1981 Martin Hurson from Cappagh, died aged 24, after 46 days on Hungerstrike in the H Blocks of Long Kesh ! Remember Him With Pride ! Martin was born on September 13th 1956 in Aughnaskea, Cappagh. He was the 8th of 9 nine children. He was arrested on November 11th 1976 after a series of swoops on the Cappagh area by the British. He was subsequently tortured and forced to sign statements admitting republican activity. He was charged with a landmine attack in Galbally (which was later dropped) but still faced charges of IRA membership, possession of the Galbally landmine, conspiracy to kill members of enemy forces, causing an explosion in Cappagh in September 1975 and possession of a landmine in Reclain in February 1976. Once in Long Kesh Martin went straight on the blanket and then replaced Brendan McLaughlin on the hungerstrike on the 29th of May 1981 after Brendan was forced to withdraw due to a perforated stomach ulcer. 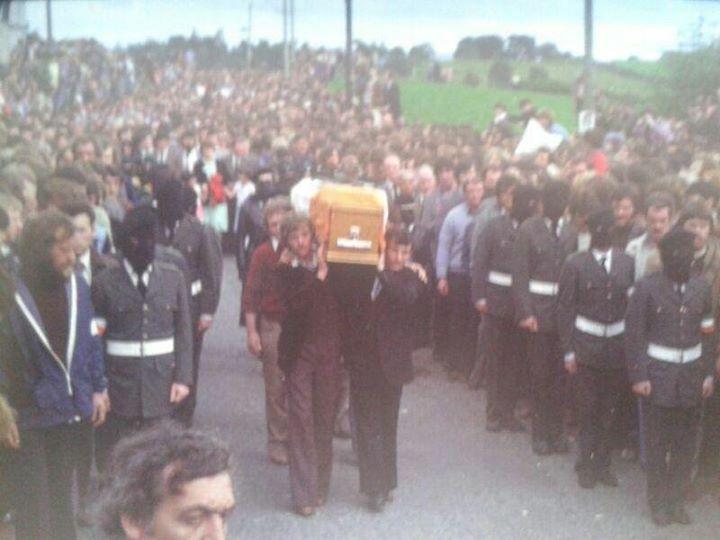 While on hungerstrike Martin took part in a Free State election for Longford/Westmeath, he polled four and a half thousand first preference votes and over a thousand transfers. Unfortunately after 40 days on strike Martin became unable to hold down water and died of dehydration less than a week later. He was 24 years old. Author seachranaidhe1Posted on July 13, 2013 Categories REMEMBER OUR PATRIOT DEADTags American Apparel, Athen, Australia, Cappagh, Facebook, Free State, Hunger strike, Irish Republican Army, James Connolly, Land mine, Martin, Martin Hurson, May 1981, National Graves Association, TerrorismLeave a comment on ON THIS DAY IN 1981 Martin Hurson from Cappagh, died aged 24, after 46 days on Hungerstrike in the H Blocks of Long Kesh ! Remember Him With Pride !